Native American (Navajo) women and children pose on and near a covered wagon. Horace Swartley, between 1901 and 1908]. "To enjoy such a trip ... a man must be able to endure heat like a Salamander, mud and water like a muskrat, dust like a toad, and labor like a jackass. He must learn to eat with his unwashed fingers, drink out of the same vessel as his mules, sleep on the ground when it rains, and share his blanket with vermin, and have patience with musketoes ... he must cease to think, except of where he may find grass and water and a good camping place. It is hardship without glory." he enormity of the task faced by covered wagon emigrants in the American West is almost unimaginable today. For many 21st-century Americans, raised in the congestion of cities and the sprawl of the suburbs, the vastness of the North American continent is only vaguely understood. A gently rolling landscape, dotted with modernized farms and gas stations, and crisscrossed by well-paved roads, is about as close to isolated rural America that many people ever come. But even today, there are places in the Middle and Far West where modern-day emigrants can look to the horizon -- in every direction -- and see nothing but grass blowing in the wind. No trees. No houses. No crops. No people. No Stuckey's, no Wal-Marts, no TCBY's. Only by standing in such vast isolation, and by imagining spending weeks crossing it at a rate of two miles per hour, with practically nonexistent amenities, can the modern mind begin to understand the challenge of the western emigrant. Before starting out for their new homes, many settlers banded together into parties, or companies, for safety and assistance while in transit. Parties were often comprised of people from the same town or the same extended family, who were pursuing a new life in the West. The goal in organizing any emigrant party was to insure that there would be plenty of people and supplies for any adversity that might arise, from fording rivers to fighting off Indian attacks to making wagon repairs. 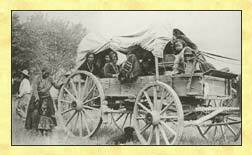 When Pamelia Dillin Fergus set off for Montana with her four children in 1864, she was part of a wagon train consisting of several families from her hometown of Little Falls, Minnesota, several of her husband's business associates, and at least 13 other wagons. The Fergus family's wagons, and the other wagons in the Little Falls company, left from Grinnell, Iowa, the western terminus of the railroad, on April 9, 1864. Like almost all emigrant journeys, the Fergus' trip began in the spring, when there was sufficient grass to support grazing, and ample time to cross the mountainous areas before the snow flew. 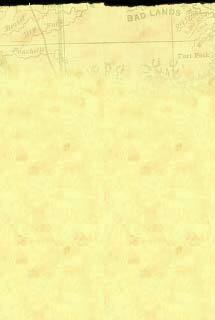 nlike the emigrants of the Oregon and California trails in earlier years, westward settlers after 1850 frequently spent hundreds of miles of their journeys traveling through "civilized" country of farms and towns. Depending on their "jumping off" points, emigrants could spend weeks on well-traveled, populated roads before they reached what was agreed upon as the "frontier." In the second half of the 19th century, the United States was a country on the move. Emigrants frequently encountered hundreds, and sometimes thousands, of other settlers while making their moves, and had the luxury of stopping off at forts, cities, and towns that had resulted from earlier migrations. Many families brought along household pets on their journeys. During one 1850 wagon train, a cat saved its owners from starvation by providing it with a freshly killed rabbit each morning. "I can tell you nothing only that were hear and its strange I wish we had never started ... it seems impossible to get their." A typical day for covered wagon settlers began long before dawn with a simple breakfast of coffee, bacon, and dry bread. After breakfast, settlers secured their supplies, hitched up their teams, and hit the trail by 7 am. Since space in the wagons was at such a premium, and because riding in them was so uncomfortable, many settlers chose to walk. Travel continued until noon, when the wagons stopped for a cold meal of coffee, beans, and bacon, which had been prepared that morning. During this break, or "nooning," men and women would gather and talk, children would play, and draft animals would rest.